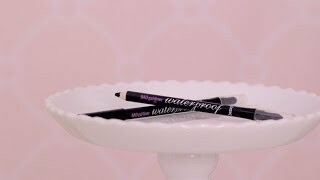 Our slimline BADgal liner waterproof eye pencils stay put rain or shine. The versatile blending tip on one end helps create soft definition or sultry drama. For flawless application in a wink, rest the pencil on the top of lashes and line across to add definition. For a softer line, flip ‘er over and blend with the sponge tip. 1.20 g Net wt. 0.04 oz.